A Grand Home in the Country! Lovingly restored and impeccably maintained, this turn-key, 19th century, brick Victorian beauty is awaiting your personal touch. Enjoy this home on 1/3 of an acre in a walkable city during the summer season, holidays or year round. In summer, entertain on the patio of the private garden and enjoy a quiet drink on the side porches, or relax in front of the living room fireplace in winter. Braggs include; a gourmet kitchen, library, music room + magnificent 3rd floor suite with WIC & full bathroom. There is radiant heat on the 1st two levels & the mechanicals including hot water heater, gas furnace, electricity & plumbing totally replaced in 2006. Less than 200 miles from NYC, Oneonta is easily accessed by public transportation, an easy commute from the Port Authority bus terminal, or a scenic drive through the Catskills. Take advantage of the Foothills Performing Arts Center as well as other music venues, the seasonal farmer’s markets, and a variety of restaurants, bistros & bars. State University of New York at Oneonta and Hartwick College call this city home. Oneonta is close to fishing, hiking & horseback riding. 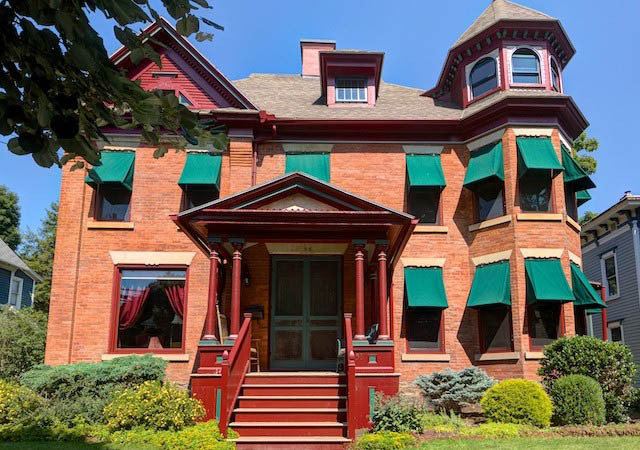 Visit nearby Cooperstown – Baseball Hall of Fame, Farmer’s Museum, Fenimore Art Museum & Glimmerglass Opera. Features:Come, experience, relax, and enjoy. Pocket doors and original woodwork throughout the house. 55 new windows from third floor to the basement.